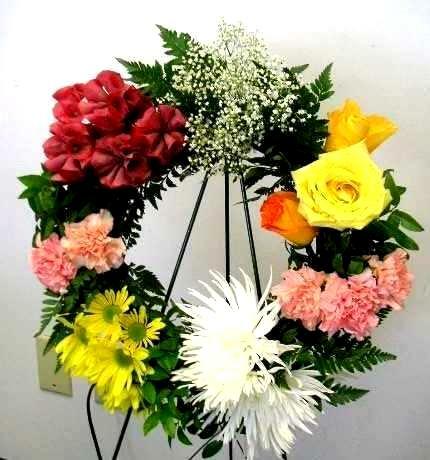 Wreath is very popular among various floral designs. This is used for many occasions for decoration purpose. You can display it by mounting on the wall of your home or entrance door. Or you often find it at the time of open house such as celebrating the opening of a restaurant etc. Further this is very popular at wedding and funeral decorations. 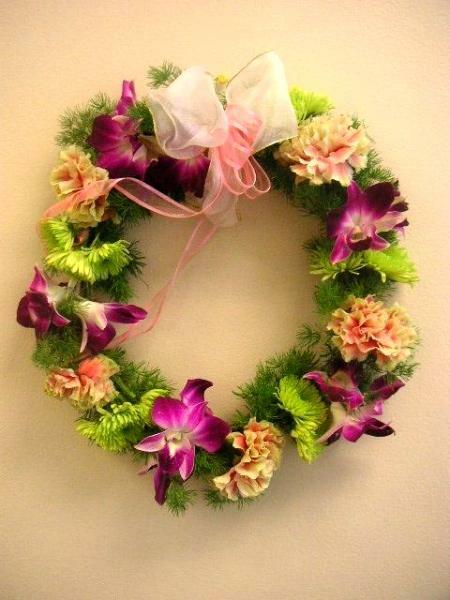 It it is a garland type of wreath, you can wear it around your neck like a lei used in Hawaii when welcoming visitors. The photo in the left side shows garland type wreath. The right one is easel mounted wreath (the one mounted on wreath holder). If you have a skill of floral arrangement, you can make this kind of wreath yourself and it is not necessary to spend lots of money for ordering it from a floral shop. In order to help people who want to make wreaths themselves, California Flower Art Academy offers a short seminar called Floral Design Class Wreath Making Program. By joining this seminar, you can learn two types of wreaths. One is a garland type and the other one is an Easel Mounted Wreath. Or if you like you can learn 2 kinds of garland type wreath. It is up to you which way you choose. All you have to pay is only $178 that covers not only tuition but also flowers and all other materials. This seminar is offered every week throughout the year in San Jose (Santa Clara County: Silicon Valley) and also Burlingame (San Mateo County close to San Francisco Airport). If you love flowers and have interest in learning how to make wreaths, please contact info@california-academy.com We help you make a difference in floral art. California Flower Art Academy has been teaching uncountable number of students since 1990 as a floral school certified by Flower Decorators Association (Tokyo, Japan). We are more than happy to help you earn practical skills of floral arranging.